What a disappointment! Nothing really happened at all last night :-) The storm passed Skomer. Well I guess that is a good thing! We wouldn’t have appreciated our roof blowing off in the middle of the night. It seems that quite a few people are interested in hearing about the fate of pup 79. There is some good news and some bad news. The good news is that it survived its accident, and the rather rude way Ed had to pull it out of the crack by its head, and was later seen on The Slabs where its mum was looking after it. The bad news is that it still did not make it. It was the 16th of October when we last saw it lying dead on a rock after probably chilling or drowning in the waves whipped up by the south-westerly wind force 6. 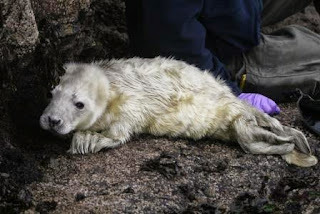 In the last two weeks we have lost quite a number of seal pups due to strong winds and big tides. Although pups can swim well they do need the safety of a nice beach to rest, suckle and warm up. The survivors often get swirled around the beaches like snow in a snow shaker which makes monitoring them a complete nightmare. The pups don't mind much getting dumped on another beach - the mothers usually find them, it is just us that mind especially when we have not had the chance to mark them with sheep dye before they move house. 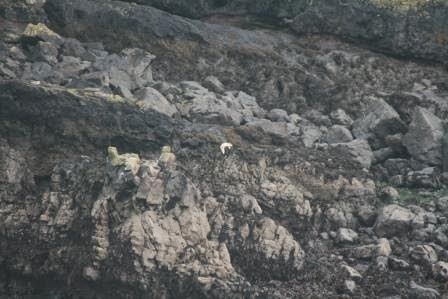 Whenever the weather allows we abseil down cliffs and scramble into caves to count and mark the pups. 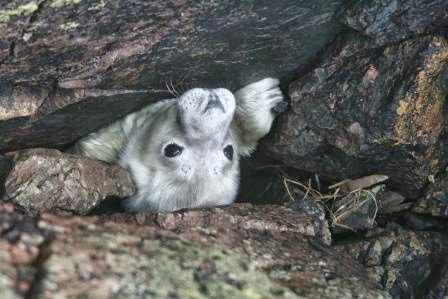 Seal Hole is one of my favourite caves. It is very eerie in there: Pitch black, the pungent smell of seal in the air, water dripping from the ceiling, sea slaters tickling your fingers when you search for a hold on the slippery rocks. And then on top of that you can hear the seals far back in the blackness snorting and shuffling; the stones crunch as their heavy bodies move about. We are convinced that the film makers of Jurassic Park used seal noises recorded in a cave to produce the snarls of Tyrannosaurus Rex and company. And then suddenly you nearly step on a still wet, new born seal pup and the only thing that comes to your mind is: How cute is that! Currently we are waiting for all hell to brake loose – the weather forecast is saying that there is a hurricane heading our way. It is 8pm and so far the storm has not reached us. The last few days have been very windy and today we were able to watch how gigantic waves crashed against the Mew Stone, foam was flying everywhere and staying on our feet was quite a challenge. Birds have been rather thin on the ground today but we have had a few good birds in the last week. On 21/10 we had an Olive-backed Pipit, a very rare bird on Skomer with the last being just a day later in 2002 in exactly the same place (next to the Warden's hut in North Haven). Nia had a Snow Bunting at the Garland Stone on 25/10 and yesterday we had a Black Redstart and a Merlin. The staff here on Skomer wouldn't be able to manage the island without the help of our weekly volunteers. 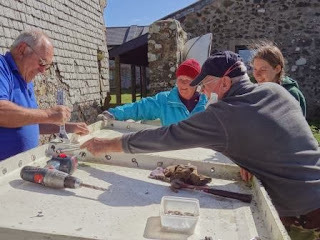 Volunteers help us in all sorts of ways from helping us to manage all of our visitors, helping us monitor and survey the wildlife of the island and carrying out maintenance and repairs. We are extremely grateful for all of their help in 2013 and are looking forward to seeing familiar and new faces next year. We are currently taking application forms for volunteers in 2014. If you would like to volunteer you can find more info and an application form here. Deadline for applications is the 31st of October 2013. 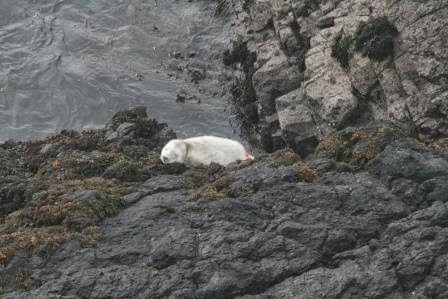 The latest pictures of our desperate seal pup from yesterday (see blog post below) show him teetering on the edge of the slabs! But he looks surprising well for the rough time he's had. The bull in our inflatable hasn't moved and remains staunchly sleeping in our boat. We'll keep you up to date with these and other seal dramas as the pupping season moves into its second half. 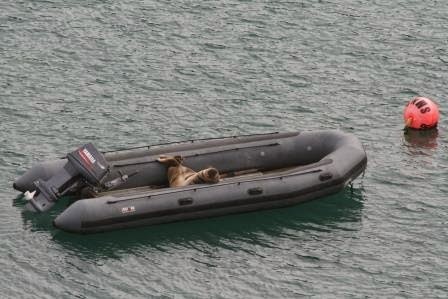 The first thing I saw today was a Grey Seal that had managed to get into our inflatable boat and was having a morning snooze. His morning snooze turned into a day in bed and he spent the rest of the day in our boat giving visitors to the island much amusement as they came into North Haven to land on the island. Now getting a seal out from between two rocks isn't all that easy and I wouldn't recommend trying it. However, eventually we got the pup out and took it down to safety, putting it on a ledge that would be hit by the tide in a few hours time. We checked it over and put a small red spot of sheep spray on its bum so that we could monitor its progress. 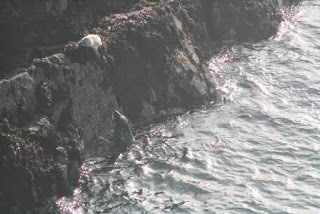 Two hours later I watched the mother desperately trying to reach her pup as the tide brought her closer to reunion. 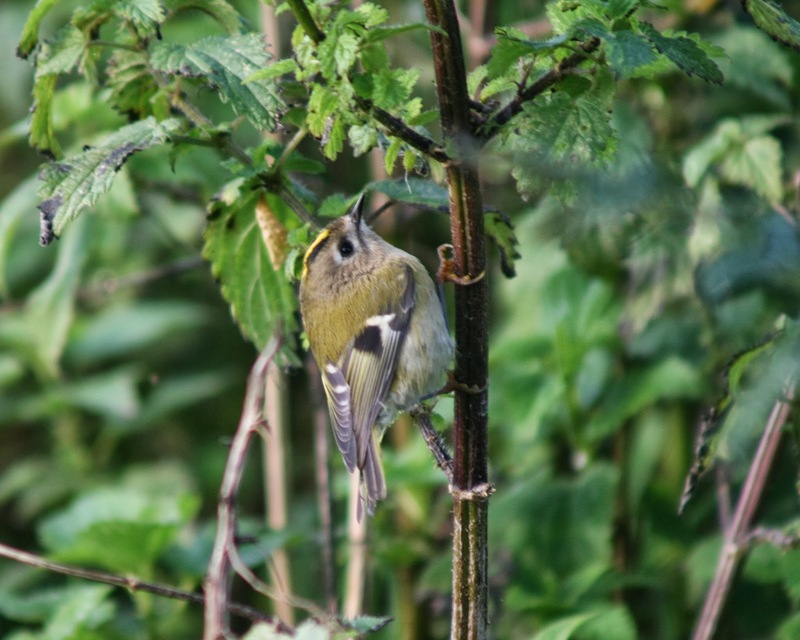 Other wildlife seen over the last couple of days includes, a Lapland Bunting and several Clouded Yellows yesterday and some Common Dolphins, a Yellow browed Warbler and many Goldcrests today. Thanks again to our long term volunteer Helen for all her hard work. 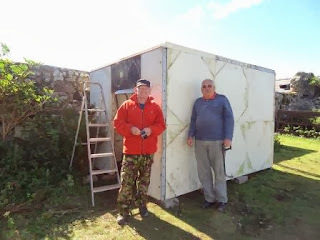 Helen leaves us tomorrow and you can read about the six weeks she spent on the island on the bog post beneath this one. Hello from the long-term volunteer on Skomer. I’ve been here nearly 5 weeks now and have got involved with all sorts of things, from visitor work to vole trapping to re-roofing! 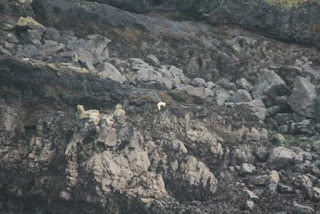 It’s a great time to be on Skomer, a really different feel to the busy summer season. There’s a very peaceful atmosphere, and though the puffins, guillemots and razorbills are long gone there’s no shortage of wildlife to see. The huge flocks of ravens are fantastic at the moment, and I could spend hours watching them playing in the wind. Going out at night I’ve had the wonderful experience of young manx shearwater fledglings using my head as a launching platform for their flying practice. During the day I’ve had the opportunity to get close up to some newborn seal pups, including abseiling down onto an otherwise inaccessible beach to mark some pups with spray paint! I’ve been able to learn new skills too, like how to drive a tractor and use a scythe. My newly acquired scything skills were put to good use, and with the help of some hard working volunteers the history trail is now cleared and accessible again. At the end of the year, it’s time to assess the disrepair that a busy season has caused, and to start to get things ready for next year. A couple of weeks ago, the weather was so bad that there were no visitors on the island for a whole week. Volunteers Sonia, Dave, Maggie and Geoff took advantage of this by getting stuck into lots of maintenance jobs. They fixed up the old assistant warden’s hut at the farm, including fitting the floor and some skirting boards – Geoff got a bit of a fright when a toad ambled out, unharmed, from behind a bit of skirting board he’d been hammering in! They also built an amazing new wood store, houses for the generator and for a water pump, and replaced a leaky hide roof. Down at the landing stage the steps were swept (though a naughty rabbit dug a hole the next night, covering the steps in an enormous mound of soil! ), the sales point was re-roofed, and some new benches were made and fitted. And that’s not all! 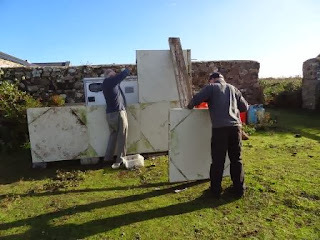 The volunteers also managed to find time for a reptile transect, removing the old wind turbine, tidying the farm garden, dismantling old boardwalk and more. They did an amazing amount of work, and really helped get things sorted. 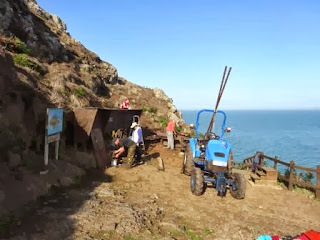 I would like to thank them, and all the other wonderful volunteers that I’ve met and worked with on Skomer so far - you are all fantastic, and have really contributed not only to island tasks but to making my time here so special. To anyone who’s considering volunteering on Skomer, whether for just a week or longer term, go for it – you’ll have an amazing time and a truly unforgettable experience.